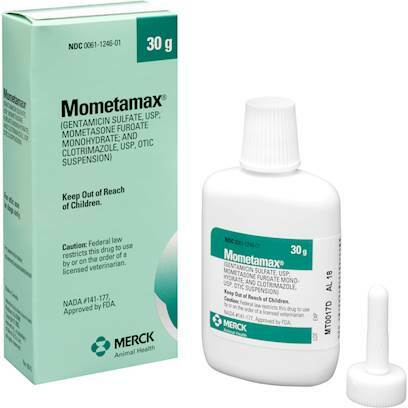 Mometamax is prescription ear infection treatment for dogs that contains gentamicin, an antibacterial, mometasone, an anti-inflammatory, and clotrimazole, an anti-fungal medication. Combined, these ingredients treat ear infections and keep your pet healthy. Talk to your veterinarian about the safe and effective Mometamax. Contact your veterinarian if your pet experiences loss of hearing or balance. Side effects of corticosteroids may include an increase in the amount of drinking and urinating, increased appetite and weight gain, panting, diarrhea, vomiting, and behavior changes. Notify your veterinarian of any other medications or supplements your dog is taking, and if your dog has had any reactions to previous medications. Also, tell your veterinarian if your pet is pregnant or has any hearing loss. Thoroughly clean and dry the external ear canal before treatment. Continue treatment for 7 consecutive days.